TURKEY: only $748 per pax for 5D4N stay at 4-star Park City Hotel & 4-star Peri Tower Hotel or simialr + Meals as per itinerary + Porterage at hotels + Local Taxes. Min 2 to go. * Depart from Singapore on Thursday night and arrive in Istanbul Ataturk Airport on Friday. This hotel is located in the heart of Istanbul, 100 meters from lively Taksim Square and Istiklal Caddesi. It is conviently located close to public transport links. Park City Hotel’s rooms feature hardwood floors and traditional décor. Modern amenities include air-conditioning, a laptop-sized safe and LCD TV. All rooms have tea and coffee making facilities. The en suite marble bathrooms offer a rain shower. Situated in the heart of the Cappadocia district, just 20 minutes from Urgup, Peri Tower HoteL offers spa and relaxation facilities, with free wireless internet, free buffet breakfast and private parking. Peri Tower provides a range of accommodation to suit solo travellers and families. Each of the spacious rooms is fully equipped with bathroom facilities. Arrival at Istanbul Ataturk airport, where Europe and Asia meets each other. Istanbul is Turkey's most populous city as well as its cultural and financial center. Located on both sides of the Bosphorus, the narrow strait between the Black Sea and the Marmara Sea, Istanbul bridges both Asia and Europe physically and culturally. It was also the Former capital of 3 world famous Empires: Roman, Byzantine and Ottoman. Today, Istanbul honors and preserves the legacy of the past while looking forward to a modern future.Upon arrival, you will meet with our representative who will be waiting with your name / company name written on a signboard and after a warm welcome, you will be transferred to your hotel. Early check in is upon availability. Free & easy at ISTANBUL. 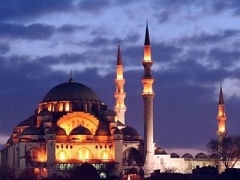 Full Day Istanbul sightseeing tour including Topkapi Palace, St.Sophia, Blue Mosque, Hippodrome, Grand Bazaar. Haghia Sophia is the most influential church of Byzantium. It was originally built by Emperor Constantine in the 4th century, reconstructed by Emperor Justinian in the 6th century and converted into a mosque by the Ottomans in the 15th century. Today, it still stands as one of the world's greatest architectural marvels. The magnificent interior is testament to its unique architecture. Shimmering biblical mosaics are juxtaposed alongside huge plaques bearing the names of Islamic caliphs. The Blue Mosque, another one of the world's most important religious buildings was built in the 16th century. The mosque is unique for its 6 minarets and its celestial interior decorated with the famous blue Iznik tiles. The Hippodrome is where chariot races used to take place at. Although little remains of the great stadium which, in its heyday, was thought to have held 100'000 people. The Obelisk of Theodosius, the Serpentine Column and the Column of Constantine are highlights. Grand Topkapi Palace, residence of the Ottoman Sultan from the 15th to the 19th century is another great place ro visit. The Palace boasts of an impressive treasury, exquisite harem, attractive courtyards and pavilions housing huge collections of antiquities. Topkapi Palace offers a true insight into the heart of the Ottoman Empire. Then visit Grand Bazaar which is the biggest sheltered bazaar in the world with 4000 shops! * Anatolian Civilizations Museum is under renovation and all sections are out of bounds unless completed by then. Meet at the hotel lobby in the morning and start a full day tour in Cappadocia.Visit Devrent Valley to see the unique fairy-chimneys. Drive to Pasabagi (Monk's Valley) to see the most interesting mushroom-shaped pinnacles. Drive to Avanos which is known for pottery, a craft dating back to the Hittite period. In the afternoon, visit Goreme Open Air Museum (Dark Church is excluded; entrance requires additional admission fee) to visit the churches where you can view remains of rock-cut and Christian settlements that date back hundreds of years. Explore various panoramic viewpoint spots of castles and fairy chimneys such as Esentepe for Goreme valley, Uchisar and its castle and Pigeon Valley. Then proceed to Kaymakli (or Ozkonak) Underground City, the place where early Christians hid from persecutors.